This memorable fruit basket is highlighted by a bottle of champagne. A one-of-a-kind creation by an experienced local florist, the basket is filled with fruit and gourmet items that may include apples, pears, bananas, gourmet cheese, crackers, summer sausage, or candies. Specific brand of champagne, gourmet items, fruit selection, and type of basket will change due to local availability or designer's choice. Picture shown online is only a representation of the gift. Specific items shown may not be included. One Bottle of Fine Champagne. if ordered by 4:00 pm EDT Wednesday April 24th. Champagne Fruit Gourmet is a hand delivered gift. These gifts are delivered by one of our local design centers located throughout the United States and Canada. Same day delivery is available for most gifts when ordered before the cutoff time. The cutoff time for Champagne Fruit Gourmet is 1 PM in the recipient's time zone. Thanks for the beautiful arrangement the office loved it! Thanks! Excellents selection of items, more than expected! This was a perfect last minute birthday gift and it was delivered super fast. I have sent a number of gift baskets and those who have received it they rave especially my friend who received the all tea basket. I felt a little down in the dumps so I sent this basket to myself. Every thing was perfect including the bottle of champagne. Keep up the good work. Great gift for grand opening of a business. 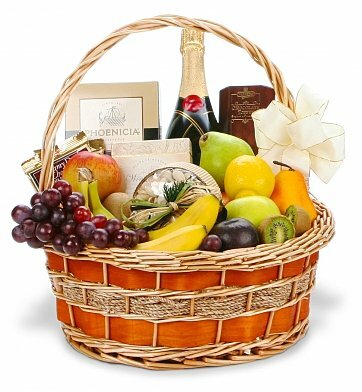 I sent the champagne fruit basket to my son on the grand opening of his business. He was thrilled to receive such a beautiful basket. His co-workers got to share the fruit and gourmet food items. Later in the evening he opened the bottle of champagne to toast the success of his business with his employees. I am glad I found this basket on line that delivered it the next day. This was my first order with Gift Tree. That you were able to deliver the package the next day was very important to me. And that my Dad and Step Mother were love every item in the basket was even more important. My Parents just raved about how wonderful and fresh all the items were along with the selection. I was so Happy to get something very nice at the last minute I was in the process of moving to another state. you made a good save for me! !